BOYARSHIN, Bangladesh, Oct 26 2015 (IPS) - Twice a week, 20-year-old Kulsum Begam, a young mother of two, spends over three hours gossiping with the neighbours. Neither her husband nor his family raises any objections. In fact, they encourage the bi-weekly ritual, almost pushing her out the door to go and meet her friends. But there is a reason for their enthusiasm: while Begam is chatting with the local women she is not idly passing the time; she is actually waiting in an endless line to collect water for the family’s use. 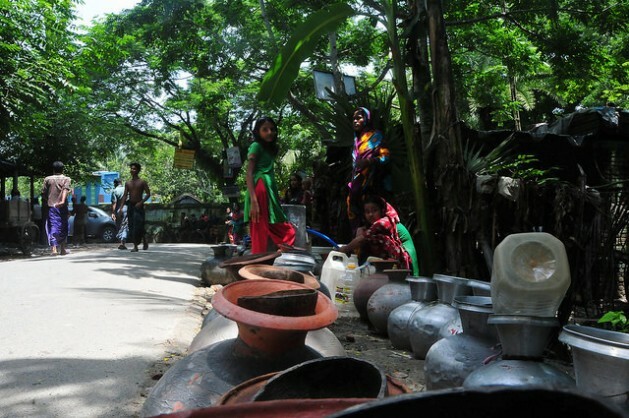 Located in Bangladesh’s Satkhira District, about 300 km southwest of the capital, Dhaka, the village of Boyarshing is plagued with water woes. Women queue for hours with their vessels at the only public tap, in a line that moves agonizingly slowly. Adding to the tediousness of their task on this balmy August morning is the fact that they are surrounded by water, the last monsoon rains having left large swathes of farmland inundated. Her troubles find echo all around this country of 156 million as it grapples with the many and varied impacts of climate change, from recurring droughts and floods, to sea surges and salinization of agricultural lands. Not everyone is feeling the crunch equally. The 1,500 residents of Boyarshing, for instance, have periodic access to clean water, thanks to a pilot project led by the Asian Development Bank (ADB) that saw the installation of 3.5 km of pipes. Although some complain that the pipes are too narrow and it takes hours just to collect five litres of water, in the nearby township of Shyamnagar the situation is far more precarious. Straddling the outskirts of the Sundarbans – the largest single bloc of tidal mangroves in the world – this village’s picturesque homes belie a reality of extreme poverty and hardship. Mizunur, a 30-year-old resident, earns around 1,000 Taka (about 12 dollars) a month, out of which he is forced to spend 200 taka (2.5 dollars) buying safe water from suppliers – known locally as ‘pani wallahs’ – who sell bulk, 10-litre cans. “Come have lunch with us, but bring your own water,” 65-year-old Riysshath Gain told this IPS reporter, adding that Typhoon Aila, which ravaged Bangladesh in 2009, destroyed many fresh and groundwater sources in rural parts of the country. ADB Director of Climate Change and Disaster Risk Management Preety Bhandari told IPS from the Bank’s headquarters in the Philippines that Bangladesh is “really feeling the pinch” of a warmer climate. If global temperature increase passes the two degrees Celsius mark, Bangladesh will lose the equivalent of two per cent of its gross domestic product (GDP) annually until 2050 on climate-induced spending. Thereafter, the losses will be steeper, reaching around 8.8 percent of GDP annually by 2100, according to ADB assessments. Between now and 2030, Bangladesh will require 89 million dollars annually to make sure the country is resilient. By 2050, the annual adaptation bill could rise fourfold to 369 million dollars. And financial stress is only one piece of the larger picture; extreme weather events pose an even greater challenge. A one-metre rise in sea levels could leave 14 per cent of Dhaka inundated regularly, while areas closer to the Sundarbans will fare worse. Increased natural disasters mean the 47,000-sq-km coast, home to 36 million people (roughly one-fourth of the population), will have to brace for storm surges, cyclones and increasing salinity. Rice production could fall by between 17 and 28 per cent, which could be catastrophic for the agricultural sector that contributes around 20 per cent of this country’s GDP and employs 48 per cent of a labour force of around 60 million people. In Dhaka, home to over a tenth of the bulging population, flash floods are now a common phenomenon. “Every time it rains for half an hour the city gets flooded; it takes another three hours for the water to recede, and by then I have lost a day’s earnings,” Hussain Mohamed, a rickshaw puller in Dhaka, lamented. There are some interventions that have worked. Bangladesh has been successful in reducing deaths due to cyclones dramatically – by over 100-fold in the last four decades alone. “When there is a high level of community involvement, then resilience programmes work better,” said Afrif Mohammad Faisal, an ADB environmental specialist in Bangladesh. This is precisely what residents in Chenchuri, a small hamlet in the Narail District in southwest Bangladesh have done. In 2012, in the aftermath of Cyclone Alia, funding from the ADB, the Netherlands and the Bangladesh government facilitated the rehabilitation of a 10-gate dam. Now a water management committee of 572 local members manages the water that flows from the Chitra River. “When we need water for our crops, either the committee decides, or villagers use mobile phones to communicate with the committee,” said Raiza Sultana, a peasant whose family depends on rice cultivation. The combination of the million-dollar investment with off-the-shelf low technology has worked well here. Villagers regularly use a simple, 70-dollar salinity monitor to test the waters and when the levels indicate that salt content is rising, they block the water flow to prevent damage to crops. “Rice production here has increased by four times and people are earning more and are in control,” Munsheer Sulaiman, chairman of the water management committee, tells IPS, adding that it used to take two days to get hold of the right person just to open the sluice gates. Now the committee employs a permanent gate operator, paying him out of funds collected from the beneficiaries spread out across the 2,400-hectare area that is served by the dam. The project’s success depended on convincing villagers like Sulaiman and Sultana on the efficiency of a community-based management approach. But experts say if the country is to properly reckon with the reality of climate change, similar changes in attitudes and policies need to be effected at the national level. “South Asia is on the frontlines of climate change – it is a journey that the region has to take and there are so many priorities at play that policy makers need to integrate climate considerations into development goals,” ADB’s Bandhri stressed. But the many conflicting issues often have government officials tearing their hair out. “Right now the priority is to feed 160 million Bangladeshis,” Abdul Qayyum, secretary to the Department of Disaster Management in Bangladesh, told IPS. He estimates that one-fifth of the population lives in cyclone-prone areas – and the bulk of them are poor. “Are these people safe, do they know they are safe, can we make them safer? These are all questions we need to answer,” he said. Into this equation comes the fact that close to 40 per cent of the population still does not have access to electricity. The ADB warns that energy demand could be further undermined by changing climate patterns that result in frequent extreme weather events. “We have been very, very slow on energy efficiency and getting the private sector to play a role in resilience,” warned Ainum Nishat, water management expert and Vice Chancellor at BRAC University in Dhaka. He told IPS that the changes taking place at the policy level are too slow to match the speed of rising temperatures. He says that at the rate things are going, the country must urgently prepare for a rise of between three and six degrees Celsius. Meanwhile, women like Begam must waste precious hours at the tap – chatting, sometimes laughing, but mostly just staring at the spout, as if their gaze will make the water flow faster. “We are used to this,” she said. “What else can we do? There is no other way to get good water.” As she spoke the line moved forward an inch, bringing her one step closer to filling up her buckets and heading home.